Adding further proof to the belief that we don’t deserve dogs, we present you with five pooches that will melt your heart. Each of these loving creatures is a finalist in the Friends for Life category at this year’s Crufts dog show, held at the Birmingham NEC next month, and it’s up to the public to decide who the winner should be. It’s going to be a tough call. There’s Snoopy, who provides cuddles and comfort to Ollie, a three-year-old who suffers from acute lymphoblastic leukaemia, and Emma the assistance dog for seven-year-old Milli who has Down’s Syndrome. 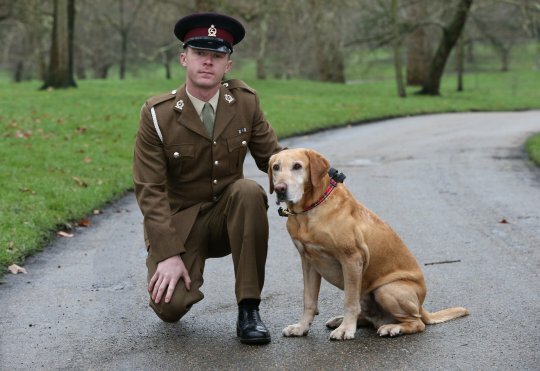 You could also choose Lance, who has spent the better part of his life sniffing out bombs and protecting soldiers and Finn, who saved his owner during a knife attack and nearly died in the process. Or will it be Ringo, who donates his blood to save other dogs. 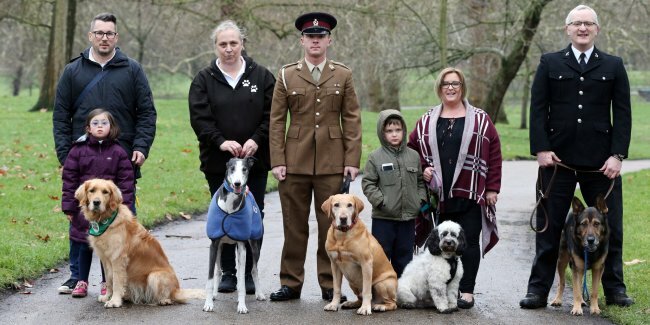 Each finalist has already won £1,000 to donate to a dog charity of their choice, and the main winner will take home £5,000 to his or her charity. Go ahead, have a read of these fantastic dog stories and see who wins your heart (and vote). Ollie Gage, originally from Banbury, Oxfordshire, was diagnosed with acute lymphoblastic leukaemia at three years old. Because of his illness, he’s forced to remain inside to avoid catching an infection, which can be a lonely experience for the little one. Thankfully, he has his best friend by his side. 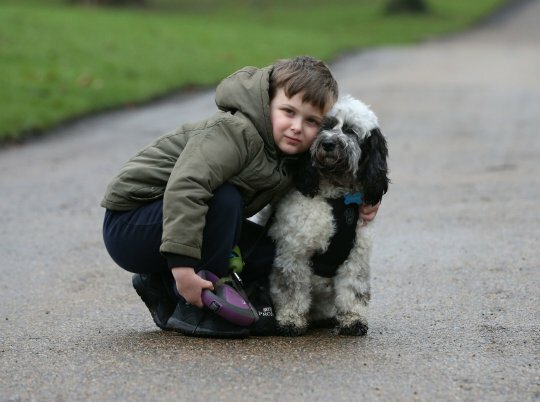 Snoopy the cross breed dog was adopted by the Gage family when he was 10 weeks old, just three months before Ollie received his life-changing diagnosis. He takes care of Ollie by giving him plenty of cuddles and playing with him to lift his spirits and be a friend in need. ‘I don’t know how my son would have coped without Snoopy by his side, Ollie was isolated from his friends because of infection, but Snoopy was there and ready for whatever was needed, whether it was a cuddle or a play,’ said Ollie’s mother, Rebecca. ‘Snoopy was even allowed in the hospital when Ollie got really sick and knew when Ollie needed him and would just lay with him. He helped Ollie learn to walk again and has been the light in such a dark time. Emma the Golden Retriever is the only female dog up for the award, which only makes us like her more. 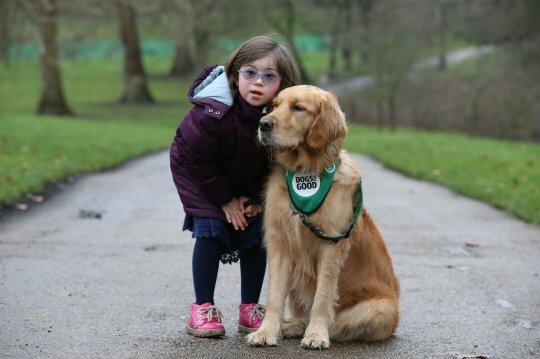 She is an assistance dog who was adopted by Steve Gunn to help his seven-year-old daughter Milli, who was born with Down’s syndrome. She suffers from numerous other health issues, including a hole in her heart, which she was diagnosed with when she was just four weeks old. Milli also suffers from anxiety and has been in and out of hospital, and often struggles with confidence issues when trying to make friends. Emma, who was adopted by the family through the charity Dogs for Good, is now her best pal. She retrieves medicated drinks for Milli, and picks up dropped items for her. And she also calms her down. Not too long ago, Milli was getting short of breath when playing, so Emma put her head in her lap to help her relax and calm her breathing. ‘Emma’s turned a light on for Milli and given her the confidence to shine as brightly out in the wider world as she does at home,’ said Steve. Finn the German Shepherd is the epitome of man’s best friend – he bravely defended his human during a robbery and saved his life. 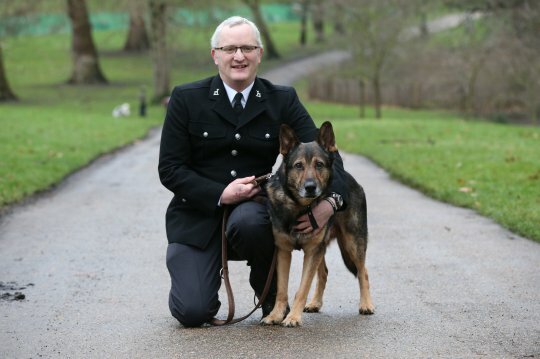 His owner, PC David Wardwell, was attacked with a knife when Finn jumped in, grabbed the perpetrator and despite being stabbed several times, didn’t let go until reinforcements arrived at the scene. Thanks to Finn’s heroic efforts, David got away with a minor injury to his hand, while Finn himself was badly injured, but thankfully survived. Unfortunately, despite the horrific injuries, he didn’t get justice in court, as there is currently no criminal damage law for service animals, something David is now campaigning to change. He has started Finn’s Law, a new piece of legislation that will make attacking a service animal a criminal offence. Ringo the greyhound is a rescue who has saved not only his humans, but also other dogs. The former Irish race dog had a tough start to life when at just three years old, he was retired and found himself without a home. 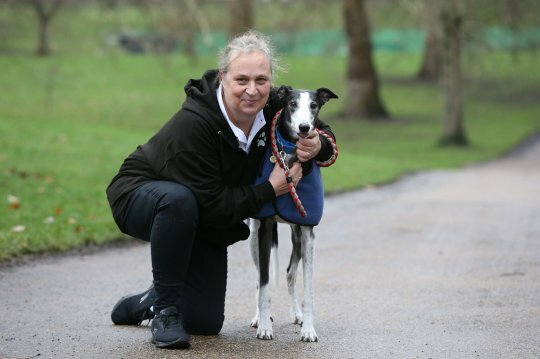 He was subsequently rescued by the Greyhound Trust who paired him with his new owner, Sarah Candy from Luton. Sarah credits Ringo with helping her turn her life around and becoming healthier, as well as supporting her daughters through their studies. I have never been a fan of this type of competition. All these dogs and many, many more give themselves to us and all are deserving of a prize. I worry for the two children in this lineup. How will they feel if their beloved companion does not win? You are right we do not deserve such selfless devotion and those of us who own dogs are beholden to give of our best to them and ensure they have the best life possible. Far too many animals suffer because of the actions of despicable humans & I find it very hard to read of, or see, such described in print or on the TV,.